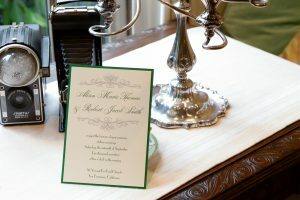 All the stationery for the vintage inspired invitations is from our Envelopments Line. Illustrated below are “Soft White” for the ecru stock and “Lucky” for the Green Stock. The Fonts are “Parfumerie Script” for the Script font and “TR Paragaon” for the Block fonts. All printing is printed by Jacques using Hyegraph Digital Calligraphy. 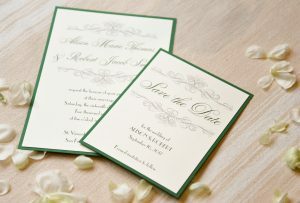 The Wedding Invitation & Save the Date cards illustrated above match perfectly in green & ecru two layer cards. The Digital Calligraphy is printed using Hyegraph Calligraphy. 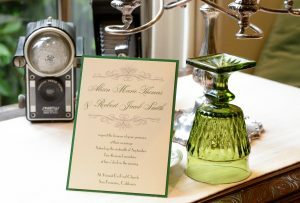 The example above shows a green & ecru wedding stationery set in front of vintage looking glass and a camera. 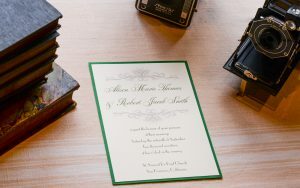 The Vintage Green & Ecru Wedding Invitation shown above, was part of the photo shoot shot by Grier Cooper Photography at Episcopal Church of St. Mary the Virgin in San Francisco. 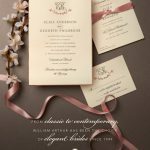 The above Vintage Wedding Invitation is created using Envelopements and Hyegraph Digital Calligraphy. The prices for the custom invitations is $4.50 per card it includes matching envelopes. Please Call, Email or Come In to Hyegraph to create your Custom Save the Date and/or matching Wedding Invitation. We are ready to design your invitations for your next special event. You can see more of our Custom Invitations for Styled shoots on our Blog. 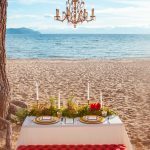 Our recent blog articles are: Napa Wedding Invitations, Winery Wedding Invitations & Lake Tahoe Wedding Invitations. We also specialize in Indian Wedding Invitations & Scroll Wedding Invitations. Our customers love to design their custom invitations working out of our San Francisco location.